Packed bitumen delivered to the coating plant in solid (cool) form befor preparing coating mixture need to melt and heat to the transfer temperature (100 ÷ 120) оС. The melting equipment consist of three chambers for loading packed bitumen (hot climate) or without packs by fork loader. There is a cavity for accumulation of melting bitumen in the bottom part. The cavity volume - 3 m3. There are tubular registers inside of equipment, in it's the thermai oil by temperature of 150 оС circulates. They load three packs of packed bitumen or three blocks of bitumen without packs in equipment simultaneously. Under the influence of heat bitumen is melting from pack and drain in accumulation cavity, from wich it's periodically evacuated by pumping station in standart bitumen capasity of CP. A real view of the melting equipment see on photo. In climatic conditions of Russian Federation with characteristic temperatures not exceeding (20 ÷ 25) оС remooving of pack is produced by it's cutting with mechanical instrument and next it's remooving from block of bitumen. Because of pack has internal adhesive coating (siliconized paper) bitumen is detached from pack without remainder. Unpacking IBC and bitumen loading in melting equipment are shown on photo or see film. In countries with a hot climate we can recommend the melting of packed bitumen directly with pack (after remooving of top cover and wood parts of pallet). Packing with bitumen is mounted in inverted position inti the receiving chamber by forklift loader. Under the influence of heat bitumen melts and drains from adhesive coating without remainder practically. 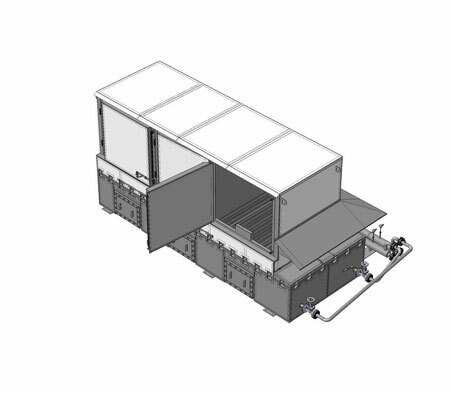 Thus sharing designed medium containers and equipment for packed bitumen meltimg has really no climatic restrictions, allowing you to supply and process packed bitumen in any region of the globe. The melting equipment has two positions: transport and working. In the transport position it can be supplied in 20-feet railway container size 1СС (standard). At the same time in one 20-foot container can accommodate the bitumen pumping station. served with an oil heater of suitable capacity. At the plant in Vladivostok melting complex of 4 units daily produced 100 tons of liquid bitumen per 12-hour shift. cardboard, plywood and boards, the negative impact from the use and disposal of packaging is minimal. Parts of used packaging (boards, plywood) can be used as a cheap construction material, or low-grade fuel. Further "Transiserviceresource" LLC intends to place on the pages of the site other ways and means of melting bitumen, packed in CP. Stay tuned for News on the company's website.